Conversation the day after the MahaSahastrara Puja. Rouen (France), 6 May 1984. Gregoire: How can we better protect ourselves if we work in an environment which is against Sahaj? 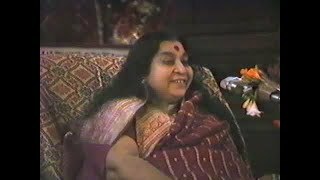 Shri Mataji: That’s the place you have to work it. So it’s difficult. But whatever things you can grasp and think this is Mother’s quality, try to imbibe that within yourself. That doesn’t mean you start shouting at bhoots first. Mahasahastrara Puja. Château Mesnières, Rouen (France), 5 May 1984. It is so wonderful for your Mother to see so many beautiful sahaja yogis assembled together, on this day of Sahastrar.